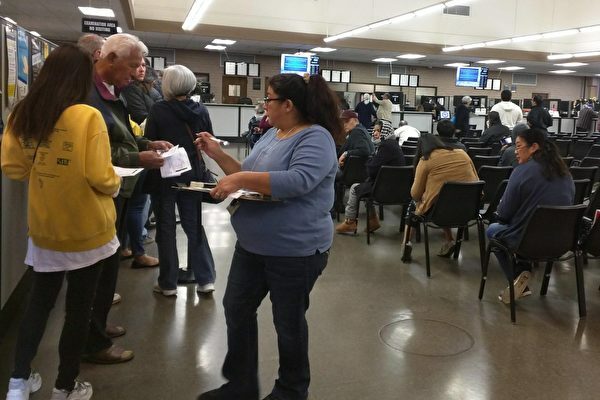 California has agreed to investigate whether the Department of Motor Vehicle’s mishandling of more than 500 voters’ registration applications last year affected the outcome of the 2018 election, under a court order issued on Feb. 5. The probe comes as part of a second settlement of a lawsuit brought by several civil rights groups, who sued the DMV and the Secretary of State’s Office in 2017 for requiring people to fill out duplicate forms to register to vote. The plaintiffs alleged the actions violated the National Voter Registration Act of 1993. On December 14, 2018, the DMV revealed that the department failed to timely transmit a total of 589 voter’s registration applications or update applications to the Secretary of State’s office. Affected voters could have possibly been turned away or their votes not counted. The court documents shows that a Quality Assurance process, which was carried out last October to manually check some of the voter registration records handled by DMV, is one of the reasons for the delays. The settlement requires the Secretary of State to provide an investigation report within 30 days that specifies if the outcome of any of the 2018 elections was affected by the delays. It also requires the Secretary of State to determine how many votes were not counted and how many updated applications were not processed within the required period. In addition, the state was asked to investigate again the reason that caused the delays. Last December, Jean Shiomoto, then director of DMV, explained in a letter that part of the issue might have resulted from delayed mailings by voters or delayed deliveries from USPS, according to the San Francisco Chronicle. Shiomoto resigned from her position at the beginning of 2019 after both Republican and Democratic elected officials called for an audit of DMV due to long wait times at field offices and mishandling of voter registration records under its Motor Voter program. The DMV has since acknowledged making 105,000 registration errors since Motor Voter went into effect on April 23, 2018. In January 2019, it was revealed that several top election officials advised the Secretary of State that Motor Voter didn’t go through enough testing and needed to be further developed before launching the program. In early February, four Republican lawmakers sent a letter to the state’s Joint Legislative Audit Committee requesting an audit of the department’s Motor Voter program. “Included in this are 1,500 ineligible voters registered by the DMV, and over 500 Californians may not have been able to vote in this past election because the DMV did not send their information to the Secretary of State’s office in time,” continued the letter.